Don’t let clogged drains get you down. 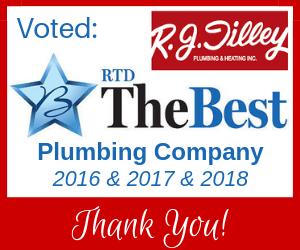 The professional plumbers at R.J. Tilley have the best equipment that will safely and effectively clean any stubborn clog or slow drain. If you are considering tackling a drain cleaning job yourself, think twice. Using a mechanical snake or caustic chemicals to clear your drain can damage pipes if not used properly. Instead, hire the experienced plumbers at R.J. Tilley who will arrive at your door promptly. Contact us today to schedule your appointment – 804-355-7110. We know drains inside and out—literally. We can quickly identify the cause of a clog and will use the proper tools to quickly clear clogged drains and get them flowing smoothly again. In some cases, we use video inspection services to identify the source of a clog and to inspect the integrity of your drain pipes or sewer line. If you’re unsure about how to clear a clogged drain, call the experts at R.J. Tilley who will get the job done right.